I published an op-ed in Scroll.in about James Augustus Hicky and the importance of Hicky’s Bengal Gazette. Quartz India interviewed me about my book Hicky’s Bengal Gazette: The Untold Story of India’s First Newspaper. My book was reviewed in the Indian Express. My book was featured in Indian Today. 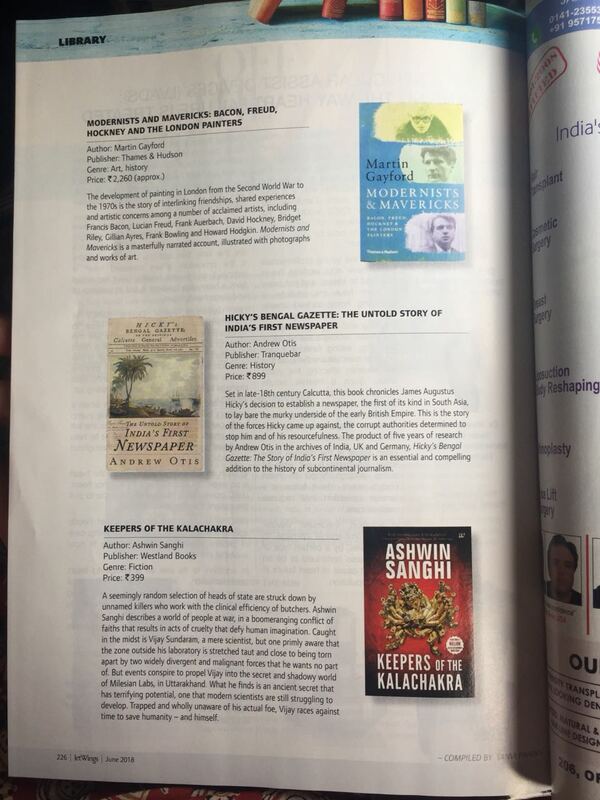 The Wire published an excerpt of my book Hicky’s Bengal Gazette: The Untold Story of India’s First Newspaper. 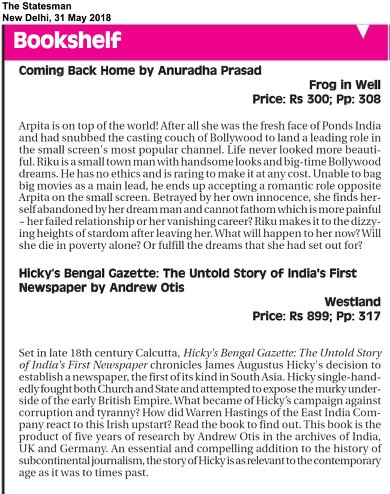 Hindustan Times, a Indian daily newspaper, selected my book Hicky’s Bengal Gazette: The Untold Story of India’s First Newspaper as one of their top picks. 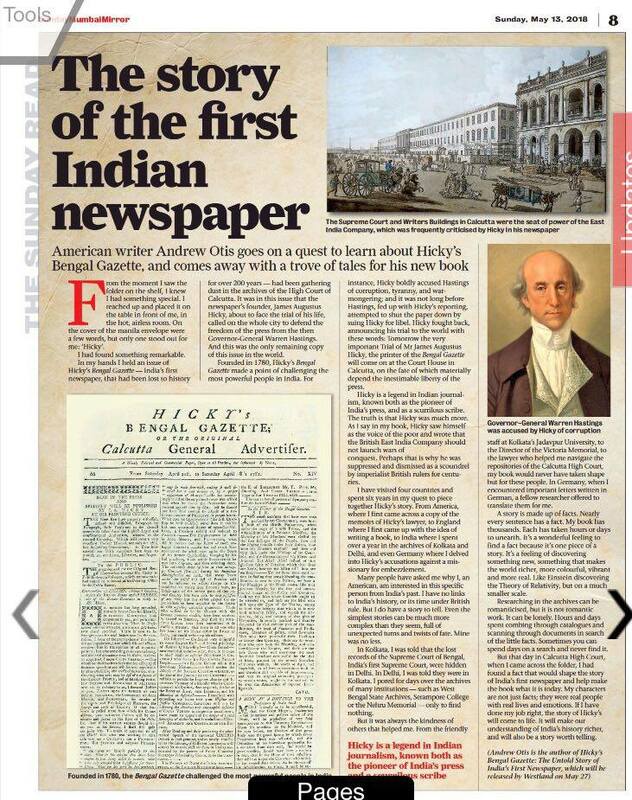 FirstPost published an excerpt of my book Hicky’s Bengal Gazette: The Untold Story of India’s First Newspaper. The Mumbai Mirror, a Indian daily newspaper interviewed me (link) about my book: Hicky’s Bengal Gazette: The Untold Story of India’s First Newspaper. 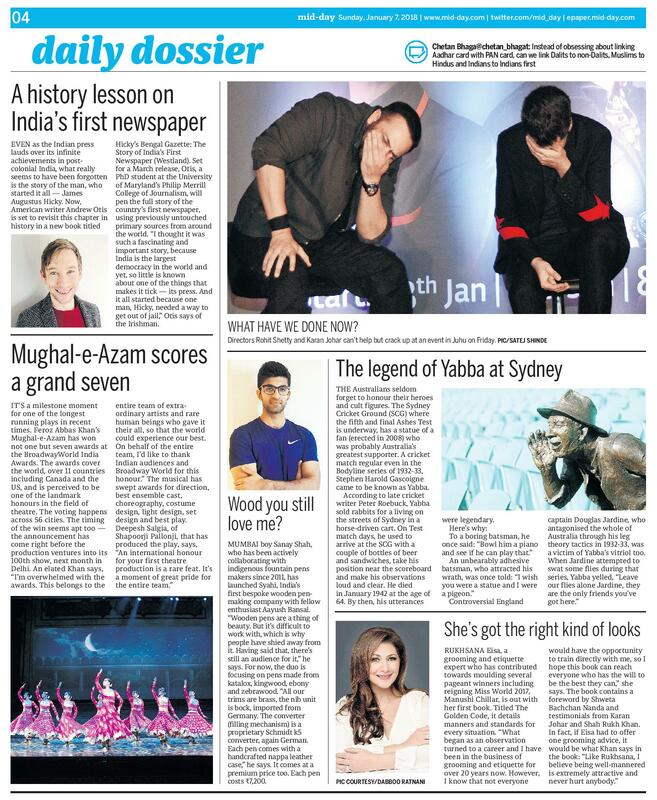 Syndicated in the Bangalore Mirror, the Pune Mirror and the Ahmedabad Mirror. Mid-Day, a Indian daily newspaper interviewed me about my book: Hicky’s Bengal Gazette: The Untold Story of India’s First Newspaper. On January 7, 2018, Mid-Day featured my book. On July 9, 2015, the Telegraph published an article on Justice John Hyde’s legal notebooks. Hyde’s notebooks comprise one of the only remaining sources of British India’s first Supreme Court. I am working with Carol Johnson at the New Jersey Institute of Technology to decode and analyze his cipher, which he used to record intrigue and corruption during his time. On June 30, 2014, Business Economics, an Indian news magazine, published an article about my research on Hicky’s Bengal Gazette and other early Indian printers. Why Should the Senate get paid, when Federal workers do not? This article was featured in Kolkata’s leading Bengali Language paper, Ei Samay (এই সময়). It discusses the US Government Shutdown in 2013. You can read the story behind the article on my blog. Much thanks to Tanmoy at Ei Samay for translating the article. Why does the Senate get paid, when Federal workers do not? The country that prides itself as the “leader of the free world” is closed for business. Extremists in Congress would rather see the U.S. burn than a budget pass with the supposedly wicked and socialist “Obamacare” intact. Since 2011 Obama and Republicans have fought a series of skirmishes over the federal government’s ability to finance it’s debt. For the first time in history the US’s credit rating has dropped below AAA because of this recurring instability. Americans I know in Calcutta agree: the U.S. government shutdown is silly, frustrating, and a sign that the Congress is infuriatingly dysfunctional. It is sad that partisan differences can effectively hold the federal government hostage. Despite the shutdown, Members of Congress are paid their salaries (while 800,000 federal workers are furloughed). Members of Congress should not be paid until they resolve this crisis. Surely they would compromise if they felt the pain of their own actions. Moreover, it is unfair that one party can win more votes but have fewer seats in Congress, helping causing this mess. (Republicans won 1.8 million fewer votes in 2012 but have 50 more seats in the House.) The U.S. should proportion congressional districts using a dispassionate computer software, rather than the current state-by-state system where political parties gerrymander districts to their own advantage. Fairer congressional districts will alleviate extremism in Congress by making seats more competitive. Let’s hope the shutdown will not cause economic reverberations here in India and worldwide. Congress needs to meet the expectations assigned to it. 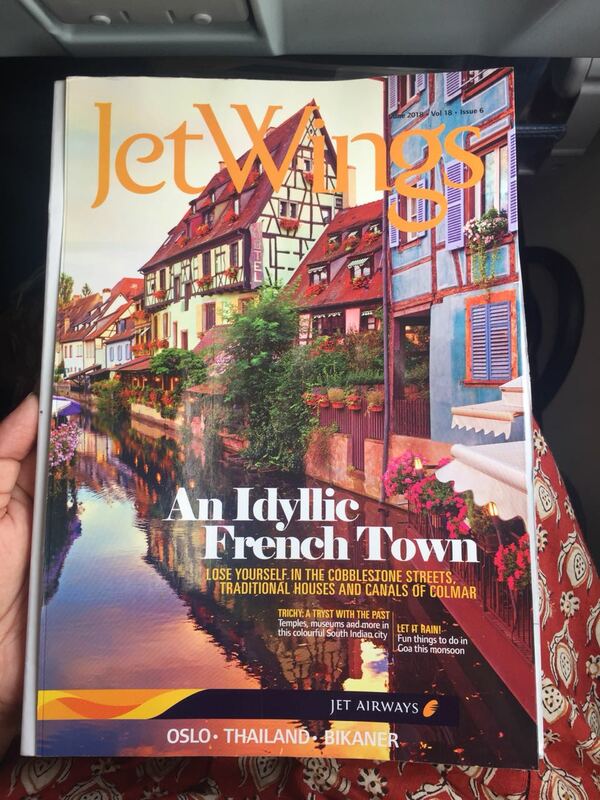 This article was featured on YAMU, Sri Lanka’s most popular culture and review website. It was written in conjunction with Sean O’Connor (Fulbright, Sri Lanka ETA 2012-2013) and was based off the authors’ first hand witnessing of war tourism in Sri Lanka’s north after a bloody 30-year civil war. From August 2013 to December 2014, Andrew researched the Early Press in India and the Bengal Renaissance under a Fulbright Nehru Research Grant in Kolkata and Delhi. Afterwards, in 2015, Andrew traveled to Germany and the UK to complete his research for his book on Hicky’s Bengal Gazette. You can read Andrew’s Statement of Grant Purpose and Personal Statement here. Years ago, while looking for resources in my university’s library stacks, I noticed an unmarked brown covered book, dusty with age and disuse. Inside, I found the Memoirs of William Hickey, lawyer for journalist James Hicky. As a member of England’s upper class in the late 18th century, he represented clients in India, the West Indies, and England, all of which he documented in precise detail. His descriptions of Calcutta struck me, with their colorful characters, complaints of a deleterious climate and entanglements between Indians and British. On June 16, 1781, an armed gang of Europeans and sepoys (Indian soldiers), surrounded James Hicky’s house, beat down his gate with sledgehammers and overpowered his servants to force their way inside. As curious onlookers gathered, the Europeans and sepoys produced a warrant for his arrest. He was accused of writing “gross libels” against the Calcutta Government in his newspaper, the Bengal Gazette, recognized as the first paper founded in Asia. What followed were years of show trials and punitive sentencing that condemned Hicky to a decade in debtors’ prison and a life as a pauper. When I read this account, I knew I needed to find out more. What followed has been many years of intensive research as I’vd worked to piece together Hicky’s life. History and journalism share a most integral similarity: they are both about weaving narratives into a story that stimulates, intrigues and captures the mind. It was then I knew I had found a good story. Hicky’s defense stands out as the media’s first attempt in colonial Calcutta to assert free speech rights. Calcutta’s early wealth of media sources attested to its reputation as India’s intellectual capital. These media were formative for the Bengal Renaissance, a 19th-century social reform movement crucial to developing the concept of India as a nation-state. The Renaissance’s rich cultural and scientific heritage can be seen in the influence of thinkers such as Rabindranath Tagore and Sri Aurobindo. Many early Renaissance leaders, including Raja Ram Mohan Roy, had backgrounds as editors and publishers. Papers, founded at first by Europeans, followed Hicky’s Bengal Gazette, slowly forming a free press in India. Newspapers are important to society due to their ability to expose corruption and guide discourse. They act as strong influencers of public opinion. These early papers, with their expressions of free thought and vigorous debate, are integral to understanding the Bengal Renaissance and contemporary India. This article was featured in a competition for NPR’s Above the Fray Fellowship. 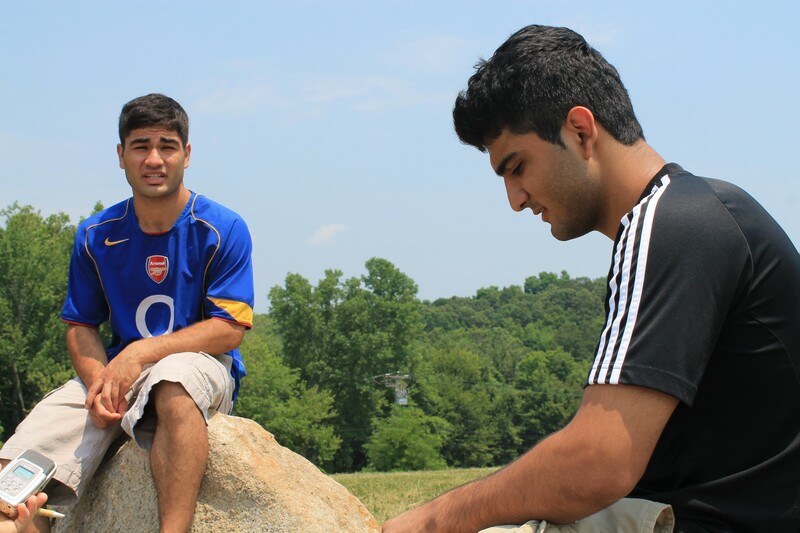 Bahar and his brother Mehran sit on two rocks besides me. They’ve agreed to meet in a park in their hometown in Connecticut, down the street from the house where they grew up. The house their father bought ten years back. Afghanistan. Nearly 20 years ago. The country remained locked in civil war with the Taliban. It’s Russian supported government had been toppled. Sensing the growing chaos, Bahar and Mehran’s grandfather, a general in the Afghan military, shepherded the family to Pakistan. They landed in America, with it’s fast food, strip malls and skyscrapers. “We actually even wore clothes from Afghanistan. Oh, outside sometimes. Then as soon as 9/11 happened it’s like people just thought they knew us. They knew everything about us. Oh, I know exactly where these people are from and what they do and what they think. Bahar and Mehran attend the University of Connecticut where Bahar studies politics and Mehran studies neuroscience. For now, away from the pressure of home, they can enjoy the day at the park. 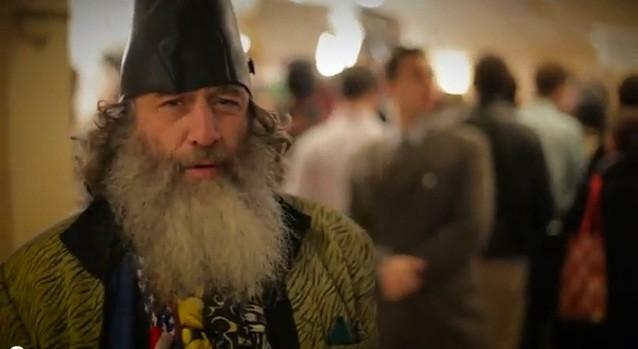 One man claims to offer every voter free ponies. Another wishes to govern on the 1611 King James Bible. What do they have in common? They’re all officially running for president, and they have the campaign songs — boom boxes included — to prove it. Reported by Andrew Otis and produced by Alexandra Dukakis. Featured on NPR Intern Edition. Photo courtesy of ibtimes. This article was featured on NPR Intern Edition. In this series, Where I’m From and Where I’ve Been, NPR interns told stories of the cities and towns where they grew up and the many adventures they’ve had along the way. I’ve never written this story down before. I think it is time. Have you ever heard of a bhang lassi? To travelers, the town of Hampi in Karnataka, India is famous for two things: it’s incredible archaeological ruins, and its bhang lassis. 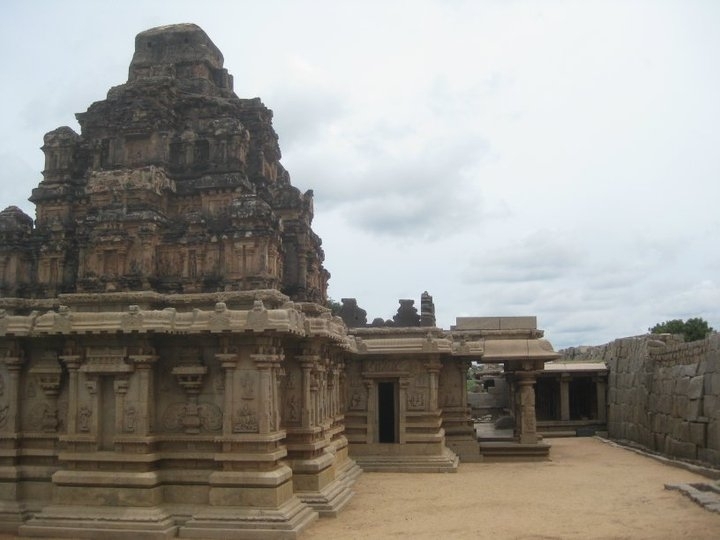 The ruins are the remains of the powerful Vijayanagar empire, what was possibly the second largest city in the world over five hundred years ago. Massive monolithic stone statues, abandoned elephant stables, and magnificent architecture jut out of the rocky terrain. That day had been sunny and hot, like the rest of South India. We had rented four single gear motorcycles and took them zooming around Hampi and the surroundings, crossing the Tungabhadra river on rickety spherical wicker rafts where some of us volunteered to work in the rice paddies. After a long day, we returned to Hampi to relax and enjoy our treat, the bhang lassis. At the time, Hampi had two main locations that sold bhang lassis. Local authorities had shut down one of them for making their lassis a little extra special. So we chose the “Chill Out Cafe,” nestled near the center of town on the roof of a two story building. We ordered four strong lassis for the eight of us and brought the total up to five when another traveler said he didn’t want his. A few sips is enough to get one sufficiently high. A whole lassi is enough to bring you to a terrifying state. The effects were delayed. But when they came on, they were immediate. The result of the bhang lassi was a heightened experience that was far too much, far too quick for someone who doesn’t like getting high. Not having had much food to eat that day, we climbed down from “Chill Out Cafe” and attempted to find a restaurant near our hotel to get some food. I decided I needed to go back to the hotel. Next, I remember lying in one of the hotel rooms as the world began to spin. Unable to find food, everyone else soon returned to the hotel, and we crammed into one room as we clung on to sanity. Hysteria has a way of feeding off itself when no one is sober. Ana was on the floor vomiting. I was in the fetal position and had vomited a few times. Tom and Eugene were far far gone. Mary escaped the worst of it and fell asleep. Then we began to hallucinate. Lauren thought her boyfriend Brandon had turned into the devil, and tried to kill him. Sean, the most sober of us, corralled us all into our rooms, turned off the lights, and told us to sleep. The darkness made the experience more isolating. Soon I began telling Sean I needed to go to the hospital. “No, You’ll be fine. You just need to relax,” Sean said. I became more persistent as the situation became more horrifying, and Sean asked the hotel owner (who gave us a queer look) for a rickshaw. The first doctor we saw was having a house party and told us to go away. The second doctor said I needed to go to a “special hospital.” As I was listening to him speak, I thought I heard the words “Stomach pumping,” “permanent psychological damage,” and “tranquilizer.” Around this time, I lost all lucidity. I remember nearly nothing from this point forward. I do remember entering a building that had white washed walls, men sleeping on the floor on mats, red plastic chairs, and a Hindi children’s show on television. I think it was some form of an asylum. Later that night, I was released. I vomited a few times more on the ride back. I thought back to a friend who had warned us before our trip: ”If you want a near death experience, try the bhang lassis.” He wasn’t joking. At least, as I felt the rickshaw cutting through the wind, I had a smile on my face. I woke up the next morning with the worst hangover of my life.